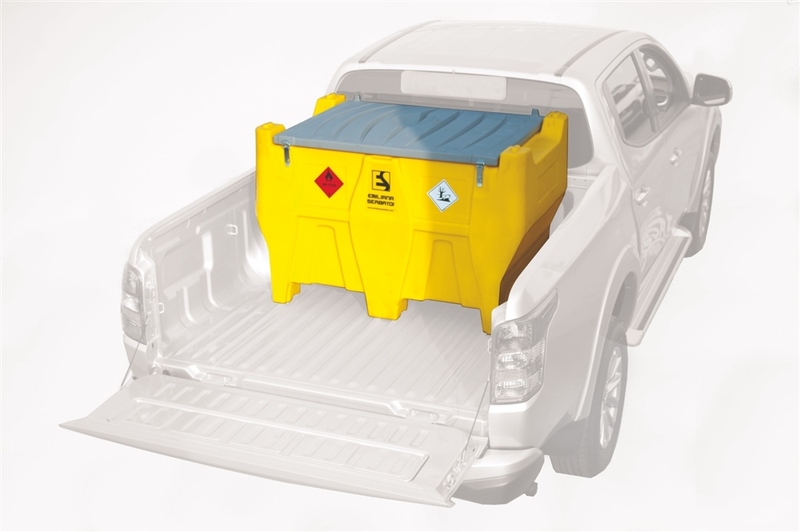 The special product line “Pick-up” which includes models Carrytank® 330, 440 and 400+50 has been properly designed to be easily installed into the back of a pick-up vehicle; this range of tanks is provided with a narrow base to allow the installation between the wheel arches of the back of the pick-up. • Wall thickness: 6,5 mm. • Aluminum filling plug, size 2”, equipped with emergency vent valve (air vent valve). • Level indicator (only Diesel compartment). • In-Line filter (only Diesel compartment). • Total dimensions: mm 1200x800x700h. • Base dimensions: mm 1010x770. • Empty weight: 32 Kg. • Empty weight with transfer unit 12V: 44 Kg. 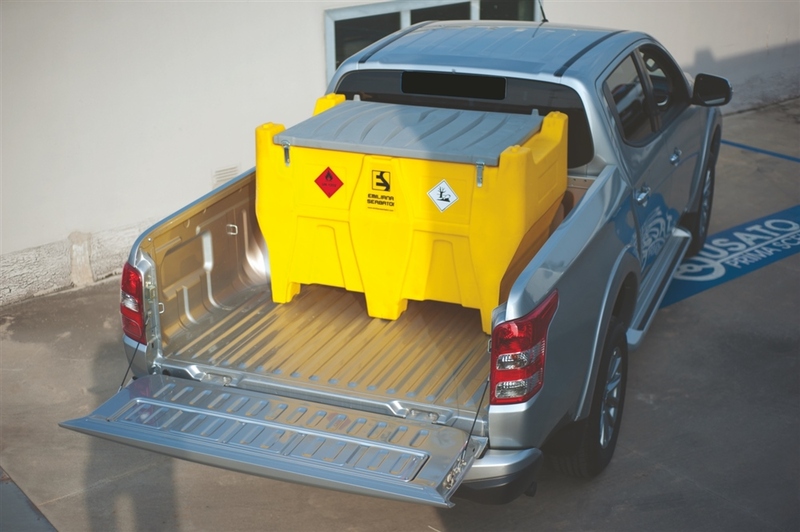 • Total dimensions: mm 1200x800x830h. • Empty weight: 40 Kg. • Empty weight with transfer unit 12V: 52 Kg. 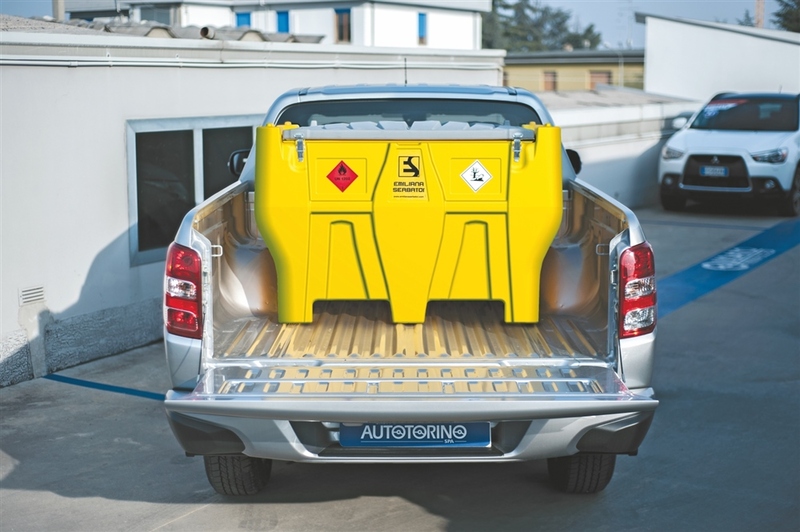 • Capacity Diesel compartment: 400 L.
• Capacity AdBlue®/DEF compartment: 50 L.
• Empty weight: 45 Kg. • Empty weight with transfer units 12V: 57 Kg. • DC fuel transfer pump, mod. 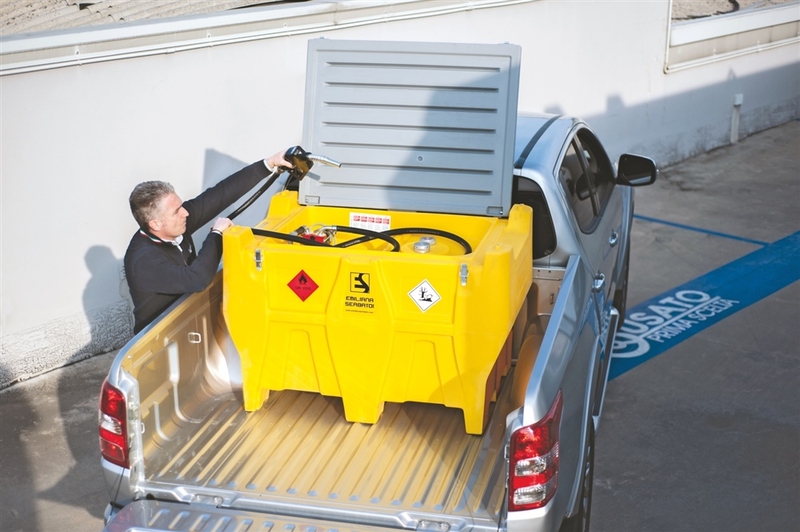 DEVIL40 (12 or 24 V), flow rate 40 l/min for Diesel compartment. • Submersible pump 12V, flow rate 15 l/min for Ad-Blue®/DEF compartment (mod. 400+50 Pick-up). • 4 m of hose for Diesel fuel and only mod. 400+50 Pick-up 4 m of hose for AdBlue®/DEF. • Automatic nozzle for Diesel fuel and only mod. 400+50 Pick-up manual nozzle for AdBlue®/DEF. • 4 m of battery power cable and clamps for bat-tery connection. • Optional: digital flow meter for Diesel fuel, mod. M24. • Optional: water separator filter for Diesel fuel. • DC fuel transfer pump, mod. DPUMP (12 or 24 V), flow rate 70 l/min for Diesel compartment. • Opt. : digital flow meter for Diesel fuel, mod. M24. • AC fuel transfer pump, mod. DEVIL55 (230 V), flow rate 50 l/min for Diesel compartment. • 1.80 m of power cable with Schuko plug for con-nection to 230V supply (Diesel fuel). • 4 m of battery power cable and clamps for bat-tery connection AdBlue®/DEF (mod. 400+50 Pick-up).